Sheaffer 100 Fountain Pen Brushed Chrome Nickel Trim. Make that special occasion even more memorable with the new Sheaffer 100. 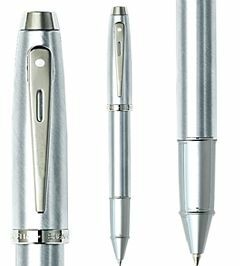 The Sheaffer 100 writing instruments are available in a variety of finishes and stylishly enhanced with a contemporary polished nickel plated grip. The timeless brushed chrome finish with shiny nickel plate trim makes a powerful statement at school or on the job. 1 x G/Boxed.